of bragging about our fine division. P.S. We are busy as hell again. Last week, somewhere along the Germans' last line in Sicily, General Allen and his division were very busy. Also on this line were at least four other U.S. divisions, at least as many British and Canadian divisions. All of them fought well. Over General Allen was a whole hierarchy of corps, army, group and theater commanders. Yet upon Terry Allen and his 1st Infantry Division, as upon no other commander or unit in Sicily, there had fallen a special mark of war and history. This mark was not the blazing glory won by the British Eighth Army's General Sir Bernard Law Montgomery in Africa. It was not the distinction won by the U.S. Seventh Army's Lieut. General George Smith Patton Jr. (TIME, July 26). Nor was it the high glow of fame now accruing to General Dwight Eisenhower and to his Army Group commander, British General Sir Harold R.L.G. Alexander. It was, instead, a mark reserved for front-line fighting men, and esteemed by them. It was the mark of a great division in being, and of a great division commander in the making. These inseparable reputations—the reputation of the division and that of its commander—are the first of their kind to be made and publicly recognized in the U.S. Army of World War II. To all soldiers there is food for thought, and to many there is satisfaction, in the fact that the joint reputation was won by a division of infantrymen, the men who fight on foot and who, up to now, have finally had to win the battles and the wars. The division was great before World War II began. Strictly speaking, it was founded in World War I, when it was the first U.S. division to land in France, by its own claim the first in combat, the first to suffer casualties, the first to win a major American offensive (at Cantigny), the last to come home from Occupied Germany. One of its regiments, the distinguished 16th Infantry, is the successor of a unit founded in 1798. Terry Allen's reputation was founded on April Fool's Day, 1888, when he was born. soldier, retired as a colonel in 1919, died in 1926. His most spectacular achievement was his son. playmate explained that his mother had just spanked him. "Because I was playing with you," said the other boy. "My opinion of myself went up like a rocket," observed Allen. When Terry Allen was growing up, the cavalry and the horse artillery were the elite services of the Regular Army. his class. Events then overtook the alphabet. Within the limits of honor, West Point cadets are adept at concealing their own and their fellows' misdemeanors. adjutant responsible for posting demerits made up his lists, he automatically included the name of Allen, T.
men. But a faculty board decided that he was beyond assistance. He had to leave West Point and the Army. and captured a party of ammunition smugglers Sept. 13, 1913, near San Ambrosia Creek." required. In that month he went to France, where he soon got his first infantry command. up with that class. Said the commandant, passing out certificates "I don't remember you in this class." whether he knew who the Briton was. "The Prince of Wales," was the reply. "Oh, my God," said Allen. and he was not going. The Prince insisted. Allen went to the party; again had a satisfactory evening. about commanding infantry battalions. I wish I could go back to the front and try them out." luck which so often favors the bold. branches and in the Army at large. of their service, went into the embryo tank service. 241 members, he finished 221st. General (then Major) Eisenhower finished first. when they won't use them in wartime?" 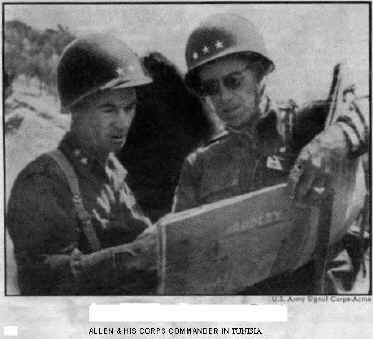 Retorted Allen "Because they make the best infantry division commanders in wartime." at home. 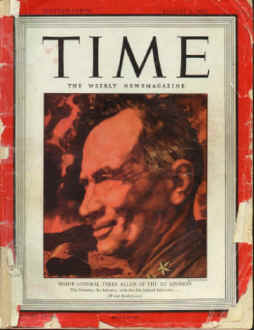 In 1932, Allen made another pitch for the future; he took a course in the Infantry School at Fort Benning. Allen a soldier likely to be mighty useful in wartime. men. He always believed he could give his men all the hell they needed without help from an body else." who is responsible for that—the enlisted men, that's who." And drink their weight in beers. In a hundred thousand years"
the landing craft which they would actually use, and missed practice in the precise timing of real invasion). Allen had a divisional staff to his liking. Brigadier General Teddy Roosevelt Jr. was his second in command. a former newsman whom Allen met and adopted at a party shortly before the division sailed for Britain. knew it was the act of a resourceful and flexible commander. thoroughly schooled in battle for more battle. But, everything  considered, the divisions engaged in Sicily did well. and the 1st division did very well. Allen. "I blooded them, didn't I?" he would say in aggrievement when he thought of his lost battalions. Finally, fuming at his divisionless division headquarters in the rear, he went to see General Eisenhower. "Is this a private war, or can anybody get in it?" say anything about what steps to take to hold it," said Allen with a grin. So he attacked. the other men down." His philosophy of the war he gave in four words "It's crazy, this war." one reason why the spirit of the 1st Division is second to none in the U.S. Army." for Gela, where the Germans counterattacked to the beaches and Terry Allen said: "Hell, we haven't begun to fight. Barrafranca, for fierce and clever battle with the Germans at Nicosia last week. "You know who is responsible for that — the enlisted men, that's who."